Professional social network LinkedIn is holding a press event today to talk about the company’s new product strategy. We’re liveblogging the announcement. As we heard from Mrinal Desai, LinkedIn is expected to announce a new social news feature today. That product is LinkedIn Today: a social news product for professionals. 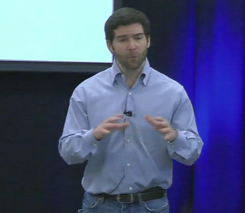 CEO Jeff Weiner took the stage, explaining LinkedIn’s product visions as “changing the way people work.” One of the first objectives for the company is that it wants to become the professional profile of record, across the web. The second objective is to be the essential source for professional insights. LinkedIn is focused on making the massive stream of content valuable to its professionals based on users professional graphs, unique data and more, extracting signal from the stream. The third objective is for LinkedIn to be wherever professionals work, whether that be on mobile, or web platforms. The company is investing heavily in its Open API platform to bring LinkedIn to third-party applications. VP of Product Deep Nishar says that we rely on the power of people we trust for social recommendations. “When we make truly live changing decisions, we don’t use search, we rely on the people we trust,” says Nishar. At the heart of LinkedIn’s product strategy are identity and insights. InMaps: These maps are a visual depiction of your LinkedIn network. You can visualize where the deepest pockets are within your professional network. Skills: LinkedIn is taking the skills data from its 90 million profiles and creating a skills graph within professional communities. You can search for skills and LinkedIn will show the professionals within the skill community who are leaders in the industry. The network will also show how popular and prevalent a particular skill, which companies are using the skill and more. LinkedIn Today: This is LinkedIn’s social news platform for professionals and its newest product. 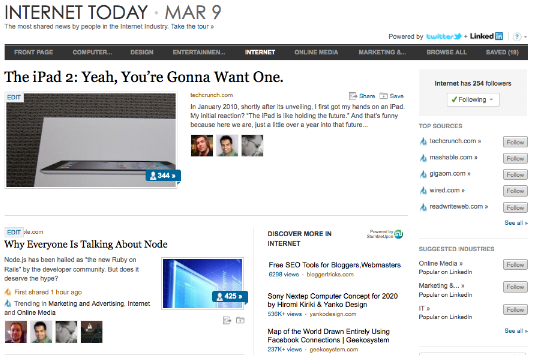 It delivers the top stories you need to know from your network and industry. 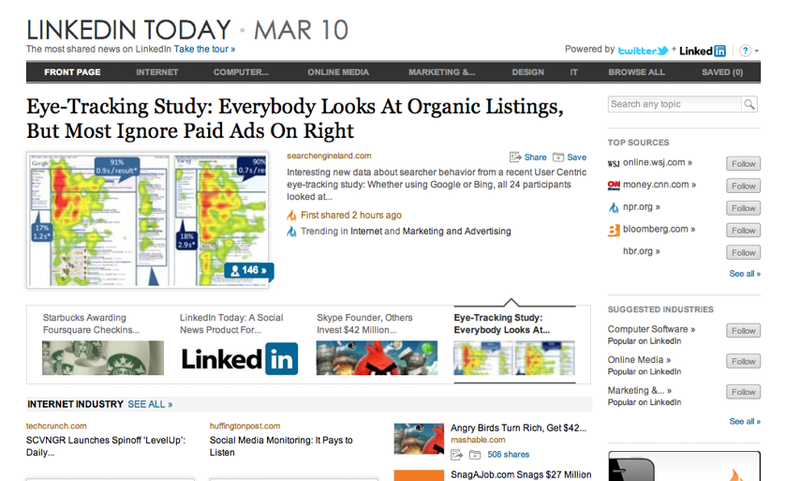 As you can see from the screenshot, the platform aggregates the most shared news from professionals in your network. You can also pull in news by industry, company, location and more. The network will show you what professionals by industry are reading, i.e. what are healthcare professionals reading right now. LinkedIn will send you a weekly email of the top industry headlines across all of the industries you follow. You can also share stories with your network, specific professionals or on Twitter (no Facebook, yet) and the network has added a customized StumbleUpon button. LinkedIn will show how many shares, comments a story has received and exactly who has shared a story. LinkedIn will show you the professional identity of the users who shared the story, and you can narrow your results with filters like industry, location and company. LinkedIn Today is also a mobile feature and will be part of the company’s iPhone app. Unique features native to LinkedIn Today include the ability to see what your connections are reading and the ability to save articles. Any articles saved on the iPhone will show up under Saved on linkedin.com/today, and visa versa. My first impression is that LinkedIn Today would be great for the iPad—I’m curious if a designated iPad app is in the works.